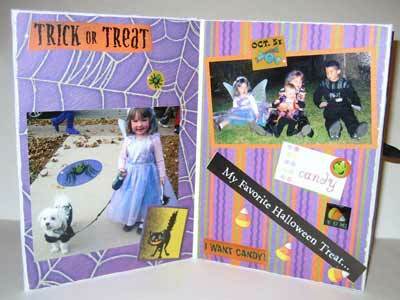 "Collate your spooky pictures in a Halloween mini album like Kimmarie's"
I was inspired by three things: First, I was pleased that my pictures came out the way I hoped. My favorite holiday is Halloween so when I saw this K&Co. 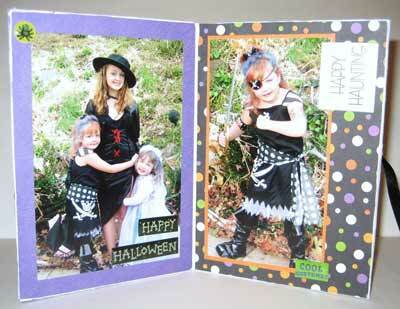 Halloween 12 x 12 paper kit, I knew what pictures would go perfectly. I just needed to find the right album... and I did! I got this great mini accordian in a box from Michaels. I like to think that my children will enjoy looking at the albums as much as I enjoy making them. I have three daughters ages: 16, 8 and 5. 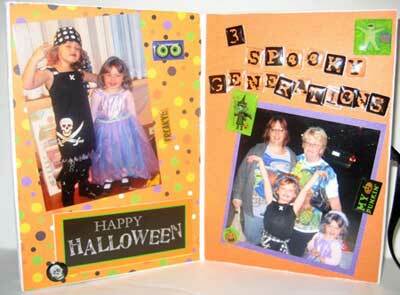 They all love to scrapbook and I just love to see them look in my albums over and over again. Sometimes I will catch my husband taking a peak even though it's not his thing. K&Co. 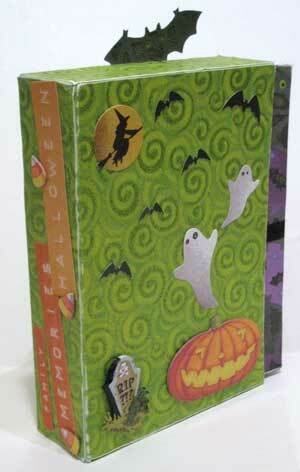 (Tim Coffey) Halloween 12 x 12 Paper Kit. Everything coordinatied nicely. As far as embellies are concerned, I couldn't go too bumpy since it had to fit back in the box so I used P.Real Life word stickers, K&CO. (Tim Coffey)apoxy stickers, Karen Foster Halloween Stickers, K&Co. chipboard and Leaving Prints (not in business anymore) word stickers, Creative Imaginations Letterz, Zip Dry Glue and Tombo Adhesive. As soon as I saw this mini, I knew it was for my favorite Halloween pictures from 2006. I chose to sand the edges instead of inking this time. The paper has so much texture - I love it. It took about 3 hours to put this mini together and that includes everything from picking out the pictures, paper, embellies, cutting and pasting. Thank you for taking the time to read about my Halloween Family Memories Mini.